Fr. 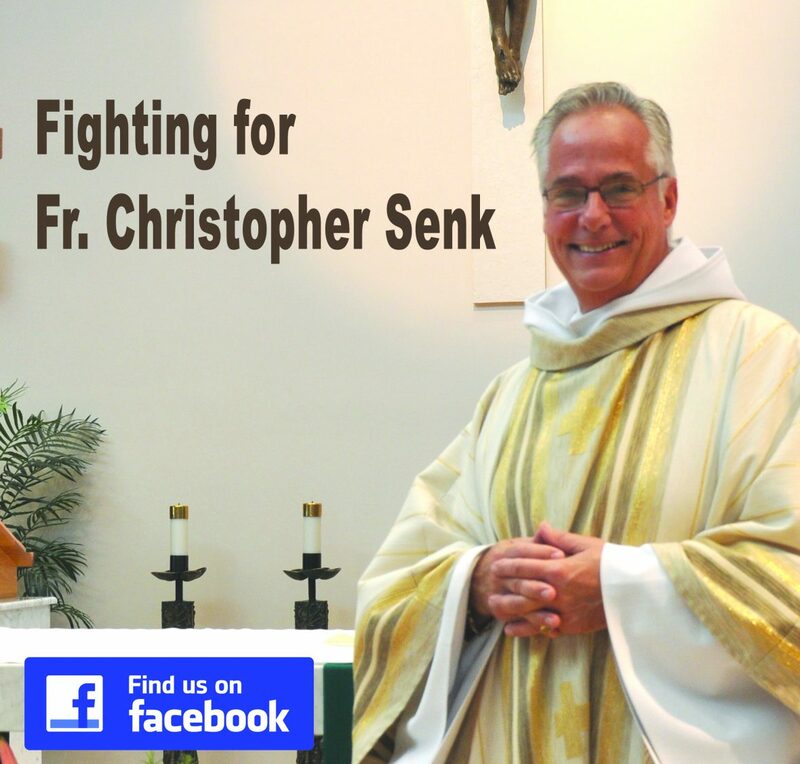 Christopher Senk has been the Administrator/Pastor of St. Isabel Catholic Church on Sanibel Island in the Diocese of Venice, Florida since April 23, 2003. This position is his third parish within the diocese and his tenure at St. Isabel’s is among the longest in the church’s history. It was in January 1998, Fr. Christopher was welcomed to the diocese by its founding bishop, Bishop John Nevins, and placed in his first assignment as Parochial Vicar of San Antonio Parish in Port Charlotte, Florida under the benevolent pastorate of Fr. Thomas Zedar. There he nurtured its growing parish community for 4.5 years, before Fr. Christopher was given the title of Administrator/Pastor of Holy Cross Parish in Palmetto, Florida where he served for 11 months. It was after this position, that Bishop Nevins handpicked Fr. Christopher for his current assignment on Sanibel Island. Father Christopher Senk with his mother at St. Isabel Parish. Fr. Christopher describes his childhood as wonderful, with parents sacrificing what was needed to enroll him and his siblings in the Catholic grammar school and then high school, St. Joseph’s Central High School. His Catholic upbringing would prove to shape his life when after high school, Fr. Christopher was accepted to St. Anselm College in Manchester, New Hampshire, as a chemistry major. During his freshman year, Fr. Christopher was drawn to the lifestyle of the Benedictine monks, was the affiliated with the Benedictine community in 1968, and began a novitiate year in 1969. In July of 1970, Fr. Christopher took simple perpetual vows and then resumed his college studies, graduating from college with a philosophy degree in 1972. Deciding to pursue ordination, Fr. Christopher began his seminary studies in the fall of 1972, and in July of 1973 Fr. Christopher took Solemn Vows as a member of the St. Anselm Benedictine community. Enrolled at St. John’s Seminary in Brighton, Massachusetts, Fr. Christopher enjoyed the privileges of being a part of the Boston Theological Institute, enabling him to take classes from well known scholars at Harvard, Boston College, Weston School of Theology (Jesuit) and the episcopal Divinity School of Cambridge. He was ordained a transitional deacon in May of 1975, and ordained a priest on June 19, 1976. After ordination Fr. Christopher assisted at parishes on weekends in the Lakes Region of New Hampshire, a custom the monastery had had for years. In the fall of ’76 Fr. Christopher was asked by his superiors to teach in the college’s Theology and Humanities departments, to work in Campus Ministry, and to become a Residence Director in Hilary Hall, the college’s oldest dormitory. Fr. Christopher’s heavy emphasis on scriptural studies during his seminary years proved to be a great asset at the beginning and throughout his teaching career. In 1979 Fr. Christopher was asked to pursue graduate studies at The Catholic University in Washington, D.C. Studying in the Department of Religious Studies, Fr. Christopher was able to not only fulfill departmental requirements, but was also able to continue his emphasis in the Scriptures. Fr. Christopher was awarded a Masters Degree in May of 1981. It was during Holy Week in 1981 that Fr. Christopher learned of his abbot’s intention to interrupt his doctoral studies by asking him to become the Headmaster of Woodside Priory School in Portola Valley, California, a Benedictine Priory that St. Anselm Abbey had assumed control of several years earlier. Although the possibility of being a Headmaster filled Fr. Christopher with fear and trembling, he was assured that the guidance of the Prior his year would be invaluable in learning what being a Headmaster was all about. At age 32, the first two years of being Headmaster were especially challenging as the standards normally associated with a fine preparatory school has been allowed to lessen. By the end of his four years there, Fr. Christopher has hit his stride and was finally comfortable being Headmaster when a personnel change forced his return to St. Anselm, and to his Doctoral studies at Catholic University. Over the next four years, Fr Christopher would complete all the requirement for a doctorate except for the writing of a dissertation. He would return for the Abbey in 1989 ABD (all but dissertation), where he would resume the three positions he had done so often: Head of Campus Ministry, teaching in Theology and Humanities departments, and Residence Director in Hilary Hall dormitory. In 1995, after a great deal of anguish, Fr. Christopher decided to seek exclausation, to leave the monastery after some 27 years. For the next three years he worked as Head of Campus Ministry, Religion teacher and Residence Director at Caldwell College in Caldwell, New Jersey. Recognizing the incompatibility of arthritic problems and winter, Fr. Christopher turned his eyes south and sought incardination in the Diocese of Venice in Florida, landing him in his first assignment at San Antonio Church in Port Charlotte, Florida. In all of his Florida assignments, Fr. Christopher has made the love of God tangible, reaching out to all members of his parish community. Whether as a parochial vicar or pastor, Fr. Christopher has strived to journey with people, calling them by name and building up a community of love. AS pastor of St. Isabel, Fr. Christopher has been a spiritual leader, inspirational homilist, counselor and friend to all of his parishioners, who have grown to love him as he transformed the members of an ordinary Catholic congregation into an extraordinary, cohesive and loving parish family.